It's by far one of my favorite holidays. It all started out when I heard people whine and whine about being single on Valentine's Day followed by wearing all black. I never understood that and I determined to celebrate the day! Before I was married I always hosted a single girls party and it was so. much. fun! This year will actually be Dave and I's first time to celebrate Valentine's Day together. We have no idea what we will be doing but if I have a say in it we might will be eating Mexican food. Amen! I'm also excited because a few of us teachers at school are having secret sisters for Valentine's Day. We are buying little gifts for the next week and a half and then next Friday I'm having them all over at our place. I'm really looking forward to this fun experience and hope it goes well. I have a fun DIY tutorial for you today. It's super simple, easy and a really fun gift to give away. I won't be making this here in Asia because well, I have a toaster oven and I have no ideas where I'd find the supplies. BUT if you are in the US this gift will cost less than $5! Step 2 - continue drawing dotted hearts inside the bigger heart. Then draw a small red heart. Step 3 - Draw a red dotted line from the inside of the silver heart all the way around the mug. I viewed the red dotted line as a reminder that love is what ties us together. Step 4 - You can either hand draw or you can get stencils. I can't hand draw letters very pretty so I opted for the stencils. Place the stencils where you want and fill it in with the Sharpie. Step 5 - Put the cups in a non-heated oven and turn it on to 350 degrees. Set the timer for 30 minutes and place the mugs inside. Make sure the oven isn't preheated as it could crack the mugs. The glass needs to heat slowly. What do you do for Valentine's Day? Do you enjoy it? This blog post was originally a guest post for Beth over at Oak & Oats. I gotta get to the store & find those markers!!!! Cute mug! We normally don't celebrate Valentine's Day because our anniversary is the first week of March. Normally it's just a simple card or some chocolates. Good enough for me! Oh my gosh this is so so cute, I love it!! I love the black mug too, I've seen a lot of the sharpie on mug projects but the black just makes it look soooo much better! I think that's awesome that you threw a single girls party before you were married, and I would be excited for secret valentine's too! Also... are you really going to be able to find Mexican food where you're at?? I would love to hear about what it's like if you do, that is crazy! We like valentine's day- we usually just do dinner out but it's a fun excuse to get dressed up :) One of my favorite things about Valentine's Day was my mom would always get us Valentine's Day cards and little presents just to show us that we were loved and beautiful- it made Valentine's Day a really good memory in my mind, and made it a nice holiday regardless of whether or not I had a significant other. Hobby Lobby has them! You can also use a 40% off coupon on your phone. Just be sure to get oil based ones. I think I purchased the mug at Walmart - it was pretty cheap too. I tagged you in an Instagram picture of some Mexcian food we found here. It is pretty good! It is all homemade and is a really neat place. You order it kind of like sushi - the give you an order slip and you check off everything you want in your burrito. A big burrito costs $3 with an additional $.80 for cheese. I love that your Mom did that for Valentine's Day! I think Valentine's Day can be made fun for so many reasons so I'm glad your Mom did that for you guys. I think that is fun though! Simple is still meaningful and yay for March anniversaries! Dave and I were married in March too. This is such a cute craft! I've never made a mug like this because I'm afraid it's going to crack in the oven. Your directions are really clear though, so I want to give it a try. I LOVE Valentine's. My husband's birthday is the 11th and mine is the 13th (Friday the 13th this year!) so we always have an entire birthday/valentine's/party week. Even when I was single I loved Valentine's because---birthday! You should be ok as long as you heat it slow! I thought it was so easy and fun. That is so fun and exciting about you and your husband having birthdays near Valentine's! It would be fun to celebrate. My nephew was born on Feb. 14 so that is a new fun things for our family. He will be two this year. You should make one! 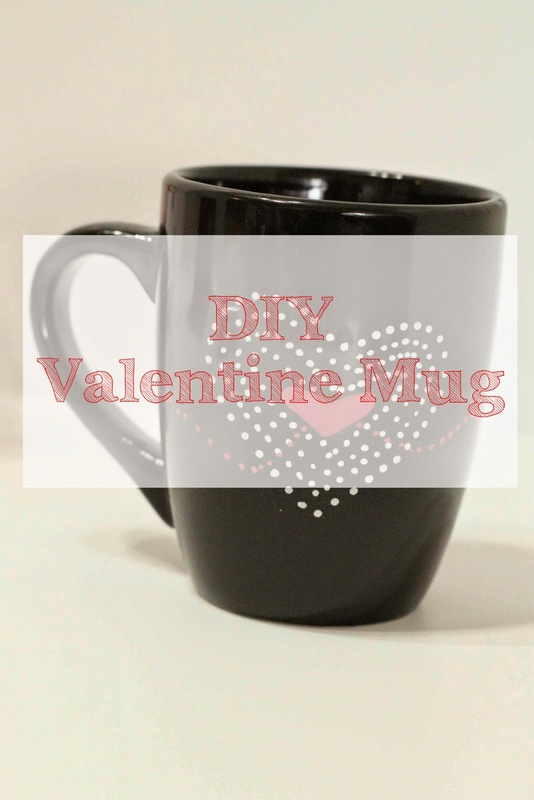 It could spruce up those old mugs real quick!